Tooth structure can be missing due to decay, deterioration of a previously placed restoration, or fracture of a tooth. Tooth restorations are the various ways we can replace or restore missing teeth or missing parts of the tooth structure. Examples of restorations include fillings, crowns, bridges, implants and dentures. We use all mercury and metal free fillings and crowns for better comfort, health, and cosmetic result. Endodontics also known as a root canal (therapy), is a treatment of the tooth aimed at clearing infection, as well as protecting the tooth from subsequent infections. We use state-of-the-art technology such as digital imaging, ultrasonic instrumentation, fiber optics, rotary files, and magnification loupes to treat our patients quickly and comfortably. The child’s first visit is important for several reasons. In many instances, it is the child’s first experience with dentistry; in some cases, the child has had a previous unpleasant experience. Emergency problems will be dealt with first; if your child is in pain we will do our best to alleviate it. If there are no emergencies, we will examine your child’s mouth (lips, cheeks, tongue, floor of the mouth, tonsil area, hard and soft palate), check the growth and development of the head, check the teeth and gums. The child will receive a thorough cleaning, topical fluoride treatment and we will take such x-ray films as are necessary. Children’s teeth begin forming before birth. Your child may begin erupting teeth as early as four months old. The first baby teeth to erupt are usually the lower front teeth (central incisors). Next you will probably see the upper front teeth. Your child will most likely have all twenty primary teeth by age three. Please keep in mind the pace and order of tooth eruption varies. The gums, ligaments, and bone around the teeth form the foundation for teeth. All structures are also referred to as the periodontium. When the periodontium is not healthy, it jeopardizes the teeth just as a bad foundation would threaten the stability of a house. Signs of unhealthy periodontium include: gums that are red and bleed easily, persistent bad breath, gums that are pulled away from the tooth, loose teeth, and changes in the position or bite of the teeth. Any of these may be a sign of a periodontal problem. With proper gum treatments, however, it may be possible to return gum tissue to a healthy state. If you're having a problem, come in and see us so we may treat it right away. The treatment usually involves a deep cleaning or root planning done under a local anesthetic, along with local antibiotic agents. If the gum disease gets too severe it may need to be treated through surgery or extraction. This is why it is important to have it treated at the first sign of a problem. Oral surgery treats many diseases, injuries and defects in the head, neck, face, jaws and the hard and soft tissues of the oral (mouth) and maxillofacial (jaws and face) region. It is commonly performed to remove wisdom teeth, prepare the mouth for dentures, repair jaw problems and perform root canals. Botox is a popular cosmetic treatment to replenish your youthful features and make you feel renewed. Millions of people benefit from BOTOX® Cosmetic treatment every year. Men and Women world-wide enjoy the rejuvenating effects of BOTOX. Looking great dramatically influences the way we feel about ourselves and the way people interact with us every day. BOTOX is a purified protein that causes tense muscles to relax. Originally this was useful in the treatment of many neurological conditions. Doctors using this groundbreaking medicine noticed that, as a side effect, deep lines in patients’ foreheads softened and their skin smoothed out. Since then BOTOX has been used to successfully treat wrinkles and facial creases. BOTOX is most often used on lines ground eyes (also known as “crow’s feet”) or frown and forehead lines. Juvederm is an effective & safe treatment used to smooth your skin and return your facial contours to their naturally youthful & healthy state. The active ingredient is hyaluronic acid (HA) which is actually a naturally-occurring sugar found in your body. It stimulates collagen production in your skin and retains water, instantly restoring unwanted lines, enhancing lips, cheeks and jaw-line as well as other areas. Benefits include added volume and definition of facial features while maintaining a natural, symmetrical and enhanced appearance. 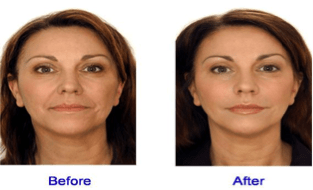 You can restore fullness in your cheeks or chin, improve lips, jaw-line and plump up smile lines. Depending on your goal, JUVEDERM can be used for many different purposes. 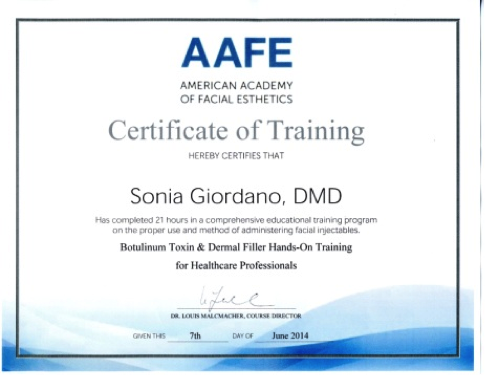 Many patients from all over New Jersey and New York have enjoyed younger-looking skin with painless BOTOX or XEOMIN treatments administered by Dr. Sonia Giordano. You can have BOTOX or XEOMIN to eliminate wrinkles like frown lines, forehead lines, crow’s-feet and bunny lines around the nose. A 20-minute treatment with BOTOX or XEOMIN greatly reduces the appearances of these wrinkles and you'll also prevent the formation of new wrinkles. You may resume normal activities immediately after treatment, and you can combine BOTOX or XEOMIN with other treatments, including Injectable Fillers, microdermabrasion and facials. If you want to look years younger, at a price you can afford, with absolutely no downtime, you'll love how you look with a Liquid Face Lift. You'll get BOTOX® Cosmetic along with Injectable Fillers for other bothersome lines, wrinkles, and folds. Results are completely natural, and you'll see dramatically youthening results immediately. There may be discounts or other benefits offered by the makers of BOTOX or XEOMIN so please Contact Us today so you can set up a consultation and possible same day treatment, so we could see what might be best for you.